A small-frame Streetracer that really moo-ves! Emergence of the darkside (auto engine scooters) was a mere shadow on the horizon. 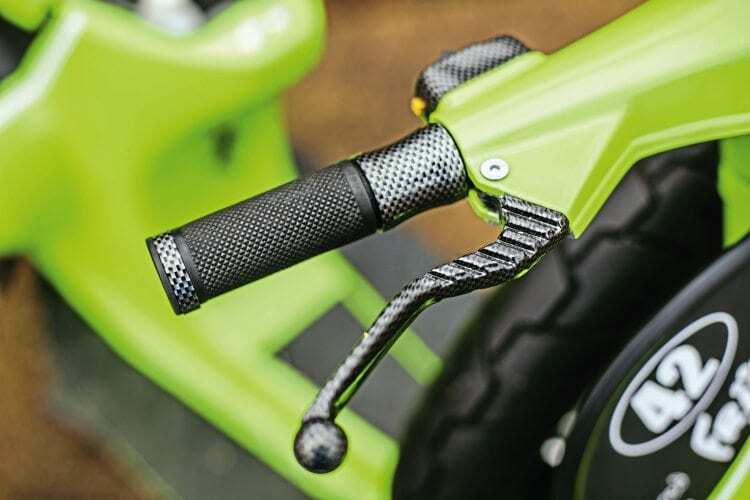 The second-hand scooter market was relatively pocket-friendly and realistic, and the rally end of the scene, alongside various elements of scooter sport, were arguably more closely aligned than they ever had been before, even in the 60s. Restrictive legislation was much less prevalent than it is today too – simply put, it was an era of fun times. Besides we were all so much younger back then. Mike Lewis, known to his mates as Miggs, celebrated his 16th birthday right in the middle of those years. 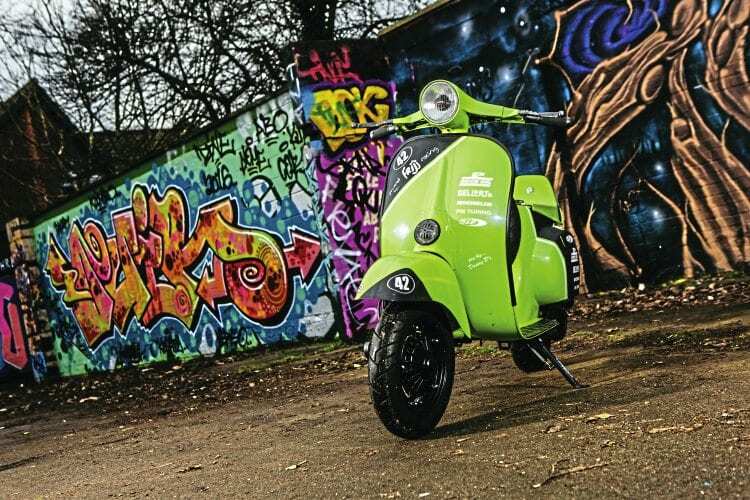 His first scooter was a ‘sixteener legal’ PK50, fitted with a Malossi 112cc kit, making it technically illegal to be ridden by a 16-year-old. Despite more than doubling the scooter’s cubic capacity, his first scooter was painfully slow. Nonetheless, it began a lifetime obsession with small-framed Vespa scooters. 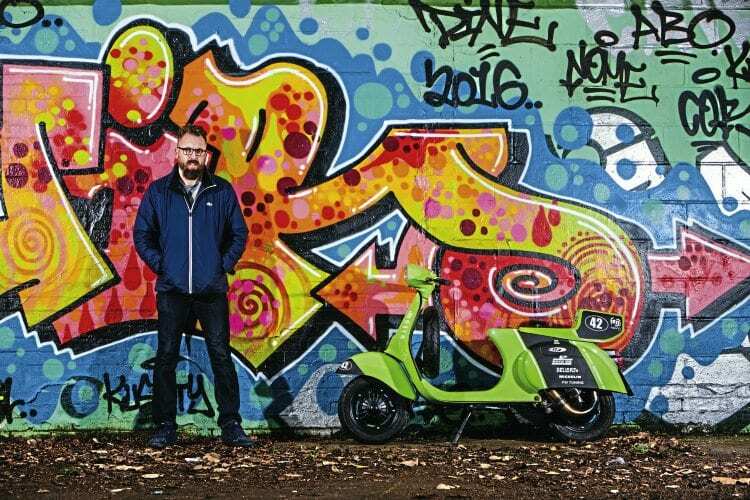 Miggs vividly recalls going on rallies during his formative years on the scooter scene and his excitement at actually seeing, in the metal, lavishly muralled full blown custom machines, which had previously had him drooling via magazine features back then. Although Miggs appreciated the time, effort and expense bestowed on those custom scooters, his personal preference was always for those of the street racer style. Indeed, along with small frame scooters, they remain his choice these days. Crucial Brew is his all-time favourite example. The christening of this particular small-frame street racer that he has made his own, took Miggs back to the early 90s, arid an incident that has stayed with him ever since: “A bunch of us back in the day developed a taste, which soon became an addiction, for Frijj milkshakes and a local fuel station was the only place we could buy it. One particular day, there was a few of us hanging out round my garage. I was working on restoring a VW Beetle at the time. 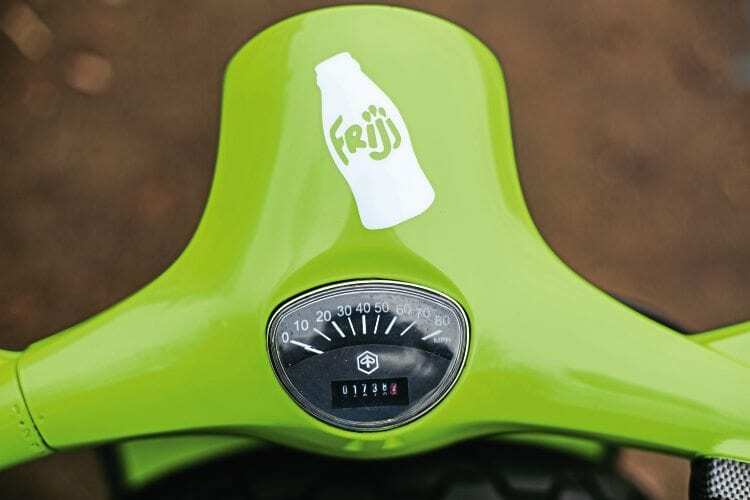 A mate arrived with the information that there was the only bottle of Frijj left at the shop — cue a mass scramble for our scoots, the race was on! Miggs took ownership of the Vespa Primavera, (see below for a brief history of the classic geared Vespa Primavera) last summer. He obtained the scooter off a mate, Terry, who had already done most of the work to it. 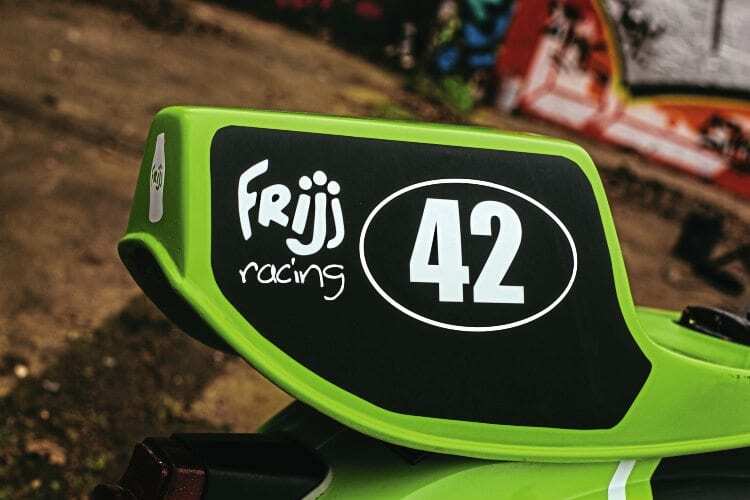 Frijj, Miggs small-frame Vespa street racer is exactly what he wanted it to be. Fun to ride, a scooter that ticks all the boxes of all his youthful preferences. 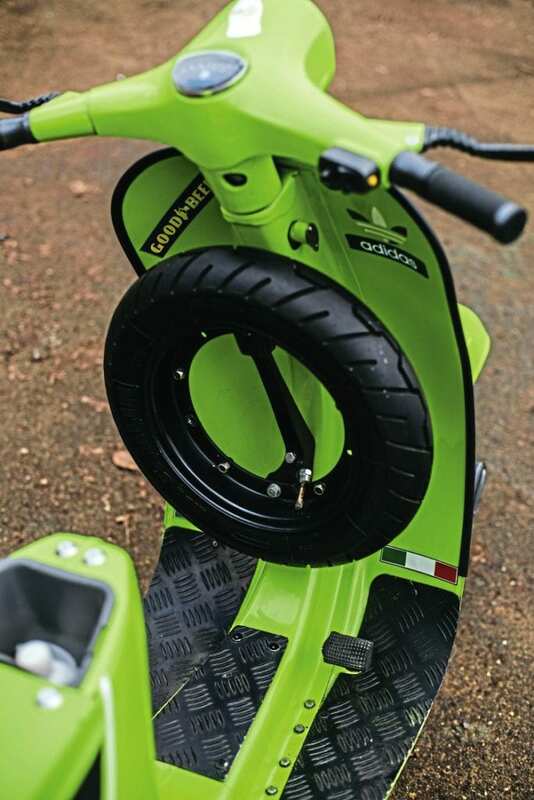 A scooter that harks back, especially visually, to a period of time when life was less stressful. At least that’s the way most of us remember those fun-packed days. Scooter club & town: Norwich Vespa Club Great Britain. When did you first become interested in scooters: 16th birthday, 1990. First scooter: PK50 with Malossi 112 was slow as an arse. Favourite scooter model: Got to be small-frame all the way. 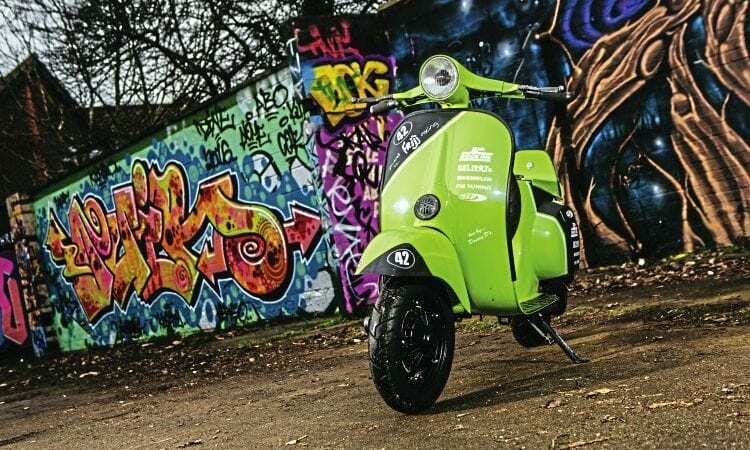 Favourite style of custom scooter: I do love classic muralled customs but my heart is in street racers. First rally or event: Great Yarmouth as it’s on the doorstep. How did you get there: PK with a P2 lump in was fun. What do you like about rallies/events: Used to love turning up to find muralled scoots from the magazines and just drooling over them. 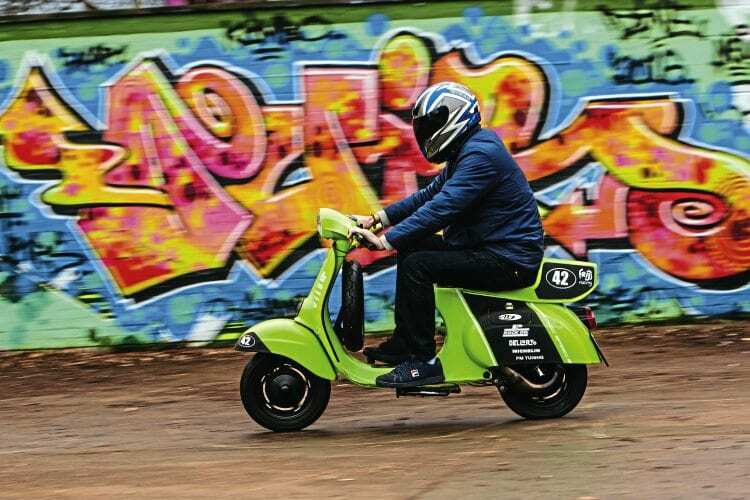 What’s your favourite Scootering magazine feature: Just love how they cover all bases. There is always something for everyone. Favourite custom/featured scooter of all time: Favourite street racer has to be Crucial Brew, custom Vespa has to be Worlds Apart, and Umbrella has to be ‘Competition Ain’t Nothing’ (Diana Ross). If you had to recommend one scooter part or item of riding kit what would it be: Decent gloves. Inspiration for project: Just the classic racers from back in the day, and you just don’t see many like this these days. Time to build & by who: Was painted and built by the person I bought it off, Terry, but I had to alter it to suit my tastes so changed it drastically to make it mine. Is the scooter reliable: So far yes, touch wood. 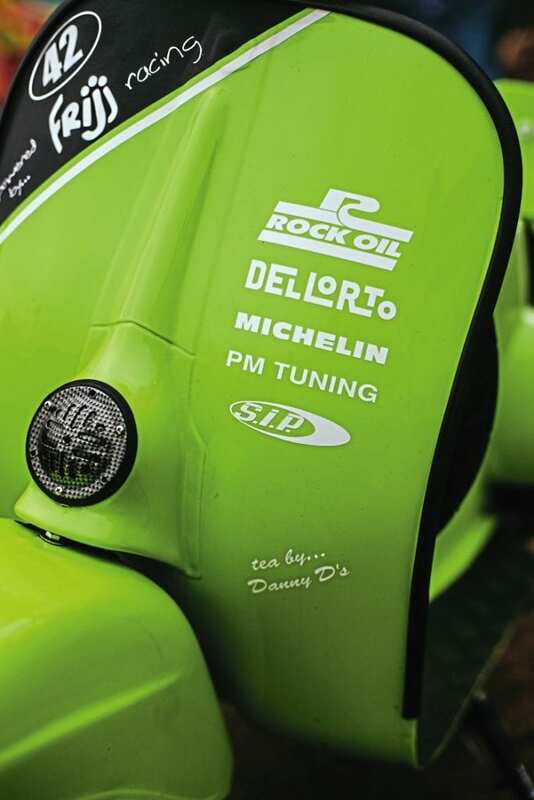 Paintwork & murals done by: Green by previous owner with a blue pearl lacquer, then I had the black done with sponsor logos race seat proper primmy rear light and now trying to sort custom disc front end. What was the hardest part of the project: Finding the time. Do you have any advice or tech tips for anyone starting a project: Just do what you want, not what the crowds are doing. Is there anyone you wish to thank: My partner Jodi for putting up with my obsession, Danny D’s — a good friend and the best Motorcycle shop in Norwich — and Terry for selling it to me. Wheeler Dealers is a popular cable TV show featuring Mike Brewer and Edd China. In the offshoot show Wheeler Dealers Trading Up, Mike acquires a 1983 Vespa Primavera ET3 in Italy. 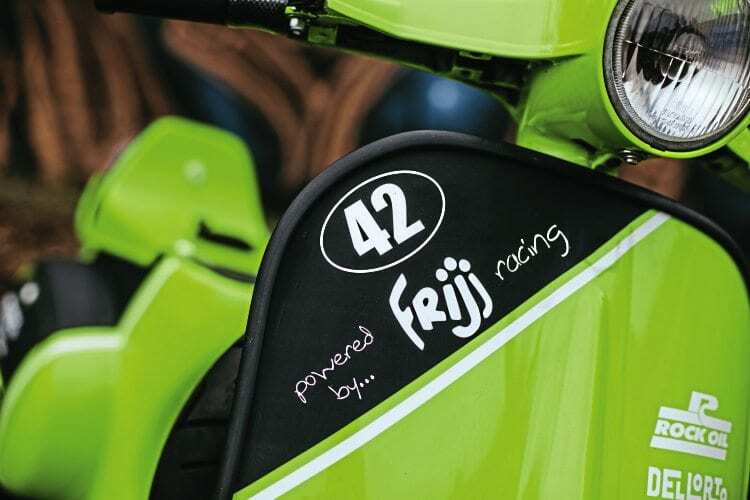 As part of the March 2013 Wheeler Dealers show, a process known as Carbon Hydro Graphic Dipping was featured. Hydro Graphic equipment had its first American patent applied far in July 1982 and is a process which can be used on many surfaces. If a specific item or part can be painted using established techniques and is able to be immersed in water, it will generally be suitable for having Hydro Graphics applied. Application commences once a part has been painted and before coats of lacquer are added. PAH-film which has had graphics printed onto is placed on the surface of the water in the dipping tank. Clear film carrying the graphic image(s) is water soluble, and after an activator is added the film dissolves. After the dipping process has commenced the surface tension of the water allows the graphics to adhere to any shape of the item being processed. Bonding printed graphics is via a chemical reaction triggered by an activator. There are a growing number of specialised outlets that offer Hydro Graphic Print Transfer in the UK. There are even Hydro Graphic home kits available online for the more adventurous, though without a physics A-level or extensive Health and Safety qualifications, personally I’d leave it to the experts. In 1965 the Vespa VMA was launched. Around the same time, two other new Vespa models were launched; the sought-after SS90 and the Vespa Super, the latter in both 125 and 150 capacities. Finned front and rear hubs of the SS90 were also fitted to VMA 125, as was the Super headset and speedometer. 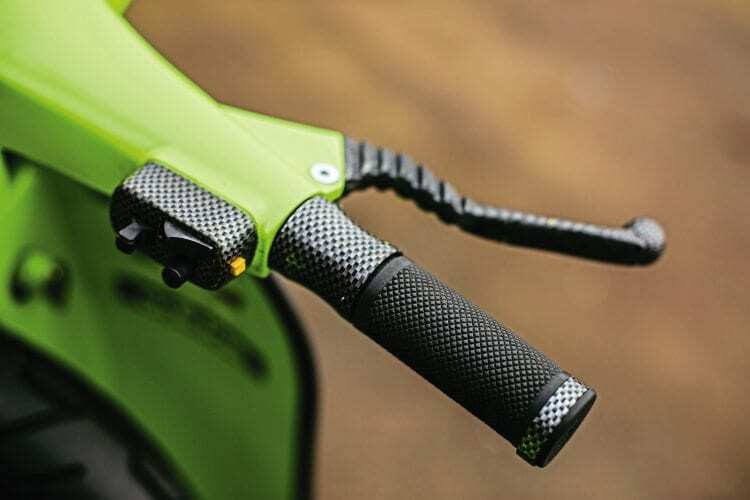 As well as a larger capacity, VMA 125 had a four-speed gearbox plus a small crest/elongated triangular embellisher on the front mudguard. 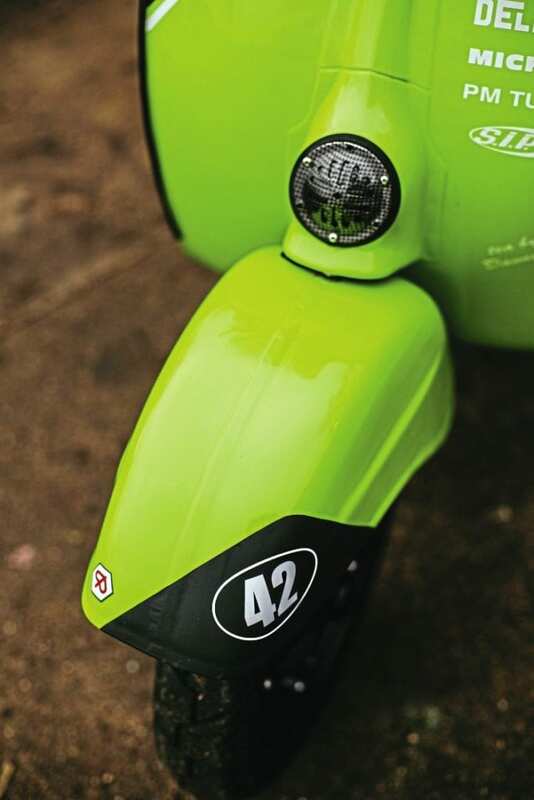 Differing from early 50 and 90 small-frames, VMA 125 was introduced with a larger side-panel access door, which was eventually incorporated into all small-framed Vespas. The 1967 VMA Vespa 125 was given an upgrade including having a name bestowed on the new and improved model, Primavera. A marginal increase in power output, an addition of a tool/glovebox on the left side panel, along with the fitting of a helmet hook and headlight rim were part of the changes of specification. The most significant change was an increased length of the floorboard of the machine, which was also implemented on Vespa 50 machines too. Until Primavera was superseded by the introduction of the PK range in 1982, there were superficial alterations such as badging and rear light units on the standard Primavera scooter. In 1976 a deluxe, top of the range, sports variant of Vespa Primavera was introduced, commonly known as the ET3. Its name was in reference to the third transfer port as standard in the barrel cylinder. 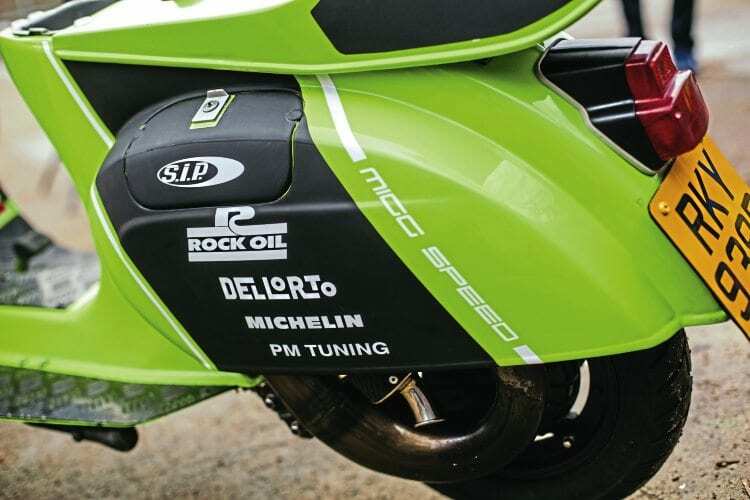 Other inclusions on the ET3 Primavera were electronic ignition along with an expansion exhaust, reminiscent of the SS90. This combination boosted the power output to 7bhp, a better and higher output than that of the more desirable SS90. The ET3 variant came along with a larger dual seat, early models came with a kind of denim covering, which was rightly dropped very quickly. 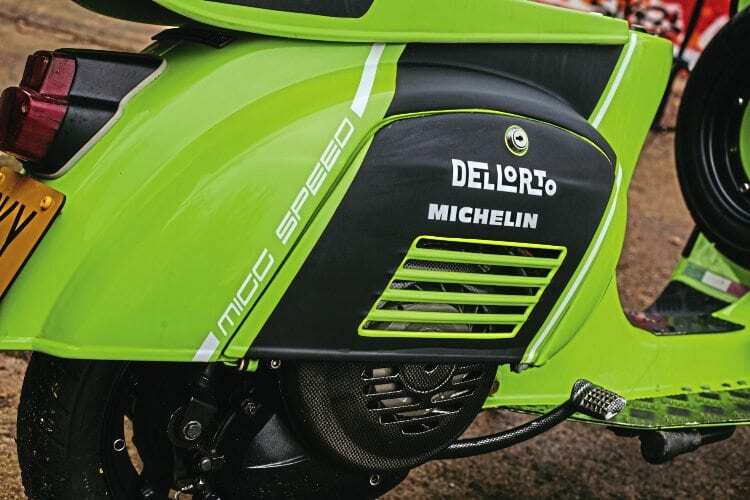 Go-faster stripes, which Piaggio called Sidewinder stripes, adorned the front mudguard and side panels, very much echoing the appearance of the large frame Rally model albeit on a smaller scale. Surprisingly, given the specification of the ET3, along with it being the fastest production small-frame Vespa up until that time, Douglas only imported a small amount of ET3 Primavera Vespas into the UK. 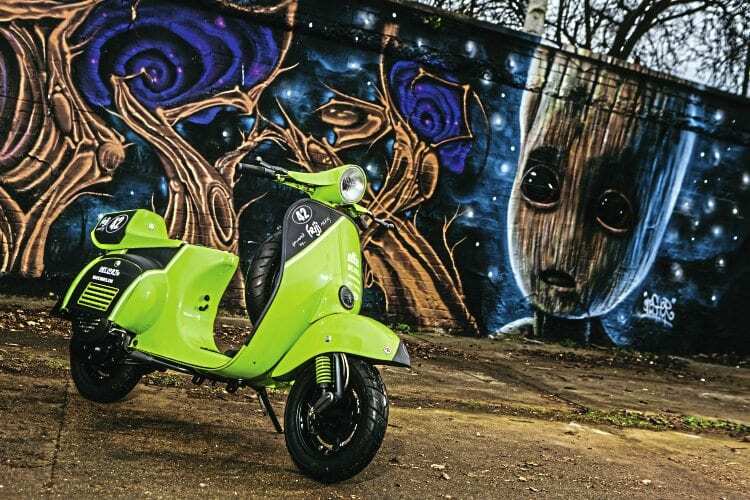 ET3 Primavera Vespa models, for a time, were both rare and sought-after machines in Britain. During the 90s, quite a number of ET3 Vespas were sourced and privately imported to the UK. For a while, said imports met the demand from prospective buyers and collectors. In addition to 220,000+ standard Primaveras, there were 153,212 ET3 models produced by Piaggio between 1976 and 1982. Exactly whey Douglas chose not to import ET3 Primavera Vespa in any quantities remains something of a mystery – one on par with Piaggio bestowing a classic name from the past that, badge apart, has no evolutionary connection with a recently made automatic scooter and its Euro 4 compliant engine!